Who said tofu is boring? When you start preparing it like you would prepare meat, it’s the same thing. Meat by itself is boring too in my opinion. 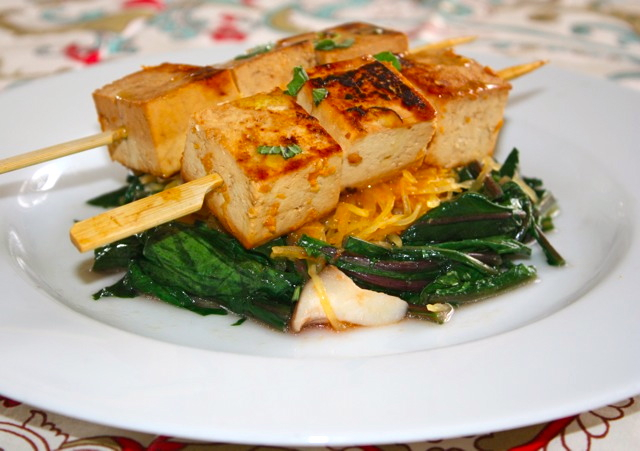 The great thing about tofu is that it absorbs all the flavors it is exposed to. So you cook it the same way, you would cook meat, and the problem is solved. I like to always have two vegetable dishes on my plate, mo matter what I eat, so you can play around with this recipe. I always say recipes are just there to give you ideas, it’s not something rigid, you can modulate them to your tastes. This recipe is very simple, it would almost be an express dish, if you didn’t have to cook the spaghetti squash which takes quite sometime. In a mixing bowl, combine all ingredients except tofu. Mix well, then add tofu, coat it with marinade and let marinate for about 2 hours in the refrigerator. Grill on a skillet until golden brown. Cut the spaghetti squash lengthwise. Wrap it in aluminum foil, making sure that it’s sealed and no air is going through the wrap. Bake in the oven at 390F for about 45 min. Remove from the oven, unwrap and remove seeds. With a fork carefully detach the spaghetti from the skin and place in a container. Heat olive oil in a pan and add shallots. When shallot are soft, add mushrooms. Stir well. Add tomatoes, garlic and wine. Adjust with salt and pepper. Cook until water evaporates from tomatoes and tomatoes thicken. Add mixed herbs at the end. Add spaghetti squash to the tomato-mushrooms mixture and mix well. Heat olive oil in a pan. Add garlic, chili and stir until fragrant. Add dandelions, salt and pepper. Add stir well until wilted. 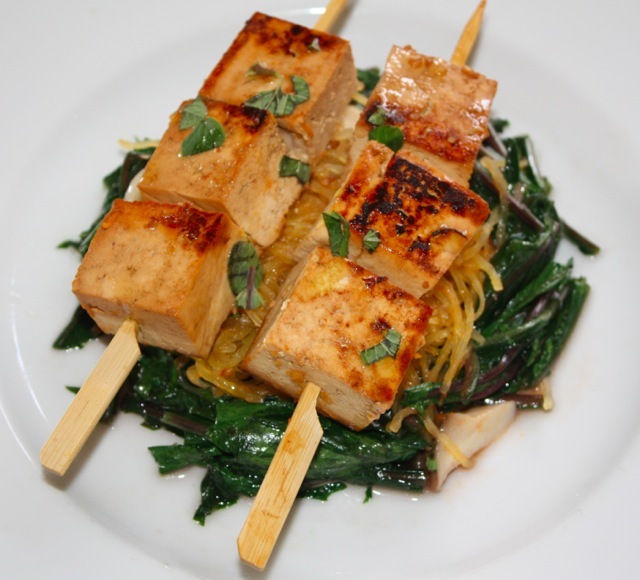 Serve spaghetti squash, add tofu skewers on top and dandelions all around. Drizzle with olive oil and eat hot. This entry was posted by silvia on November 11, 2016 at 2:20 am, and is filed under Vegan, Vegetables. Follow any responses to this post through RSS 2.0.You can leave a response or trackback from your own site.